Location.--Latitude 47°56'06", Longitude 122°04'19", in NW 1/4 NW 1/4 Section 8, Township 28 North, Range 6 East, in Snohomish County, Hydrologic Unit 17110011, on right bank 1.8 miles northeast of Snohomish, and at river mile 3.6. Drainage area is 127 mi2. Datum of gage is 30.00 feet above NGVD of 1929. Flood Stage.--The National Weather Service Flood Stage for this station is 18.0 feet. 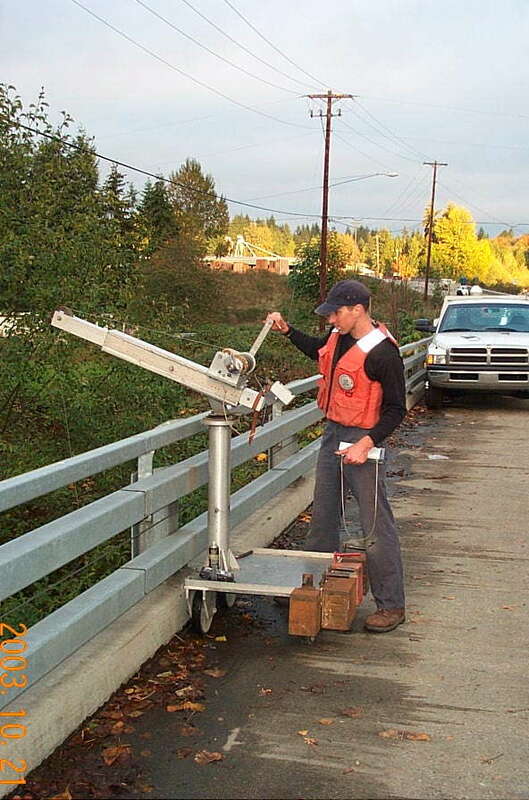 Photo of USGS personnel making a discharge measurement on the Pilchuck River October 21, 2003.